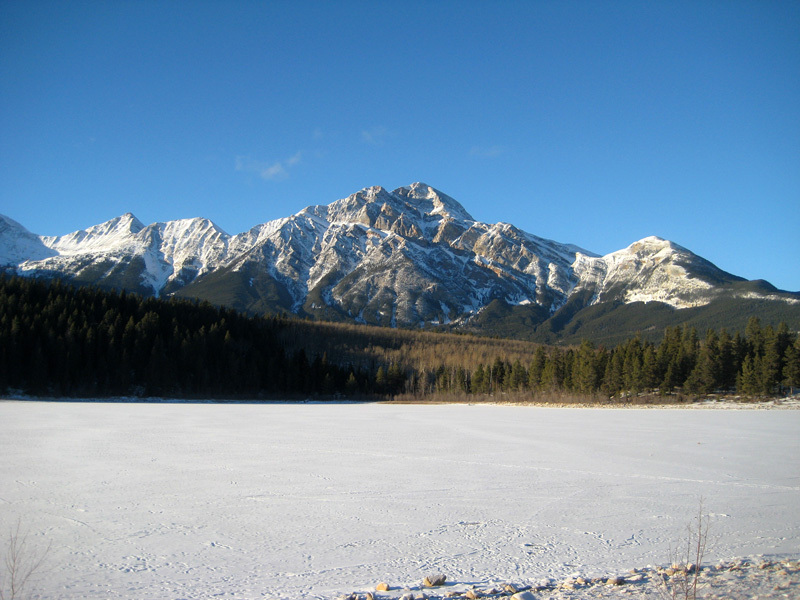 Above: The mountain's naming is most readily understood when viewed from the east on Mt. Greenock. An easy scramble, but a long physically demanding day. 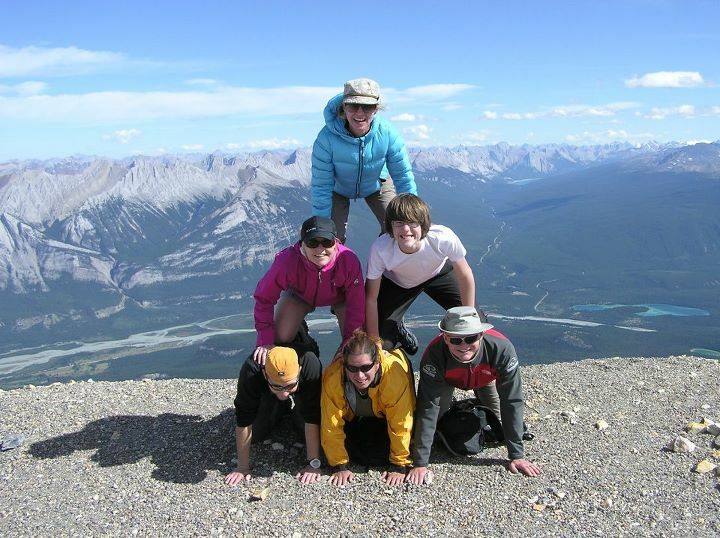 Reining over the skyline above the Town of Jasper, Pyramid Mountain beckons the curious to its forested plateau, where tourists venture to relax by the picture-perfect Patricia and Pyramid Lakes, or hike the many available trails (such as the Saturday Night Loop). The more audacious of these visitors, however, come with the intent of climbing the mountain that dominates the landscape. Starting from the trailhead parking area shortly after sunrise, an ascent of Pyramid Mountain commences with a relaxing ride around Pyramid Lake until the fire road begins its steady 1,500ft climb through the forest to the “fork”; which lies 8km away and gives the visitor the option between Pyramid Mountain (left) and a scenic lookout from the Palisade (right). From there the trail steepens as the last 4km of the fire road sees would-be climbers gain an additional 1,060ft in elevation before reaching a large, open meadow where the bike portion comes to an end. The meadow at the mountain's foot provides a great vantage point from which to plan a route. There's a fork in the path shortly after passing the cairn; one that heads up and left along a small drainage, and another that heads horizontally to the right. You want to take a left. 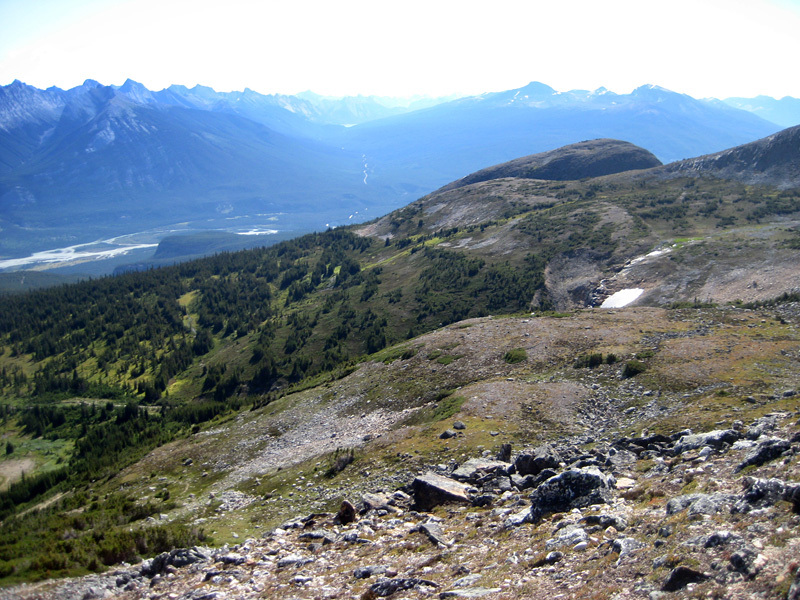 The climb from there rises quickly above the treeline, ascends through brawny patches of vegetation, and then clambers through a field of broken rock; where carefully laid steps swiftly leads one to the open “shoulder” area of the mountain. It's there, 1,200ft above the meadow below, that one gets their first taste of strong alpine winds, and their first views of Mt. Zengel, Mt. Kinross, and the Cairngorm across the valley. 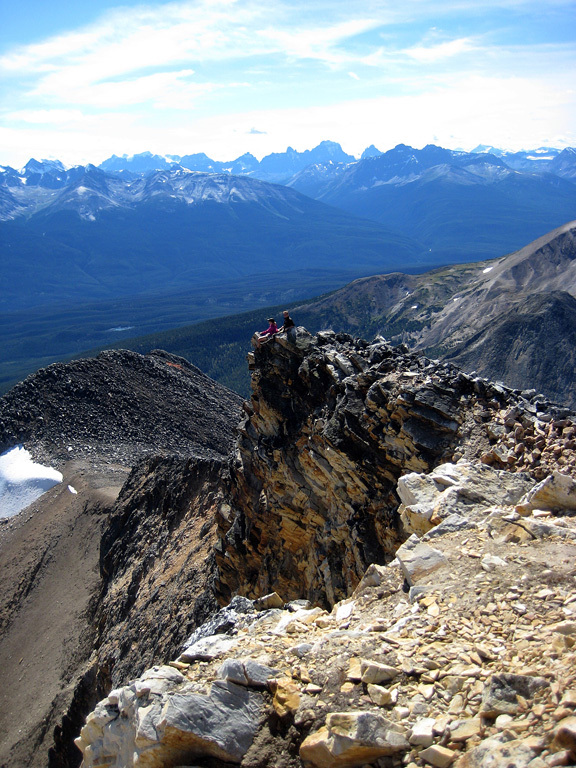 Even from that vantage point, the route to the peak appears deceptively easy. Traversing the shoulder is both relaxing and rewarding, a welcome respite after 4-5 hours of climbing, and a necessary morale boost before subjecting oneself to the challenging debris field that follows. 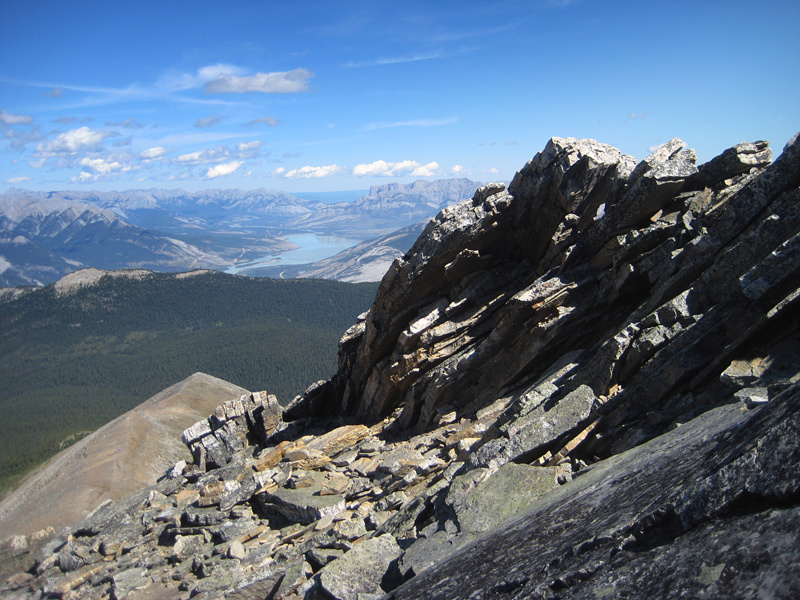 The rest of the climb is a full-out scramble, requiring the constant use of handholds and great care to maintain balance on the many different types of rock present; each of which varies in their level of stability. After what may seem like an unfair number of false peaks, you'll eventually reach the top and the puzzling concrete pads that once supported communications equipment. 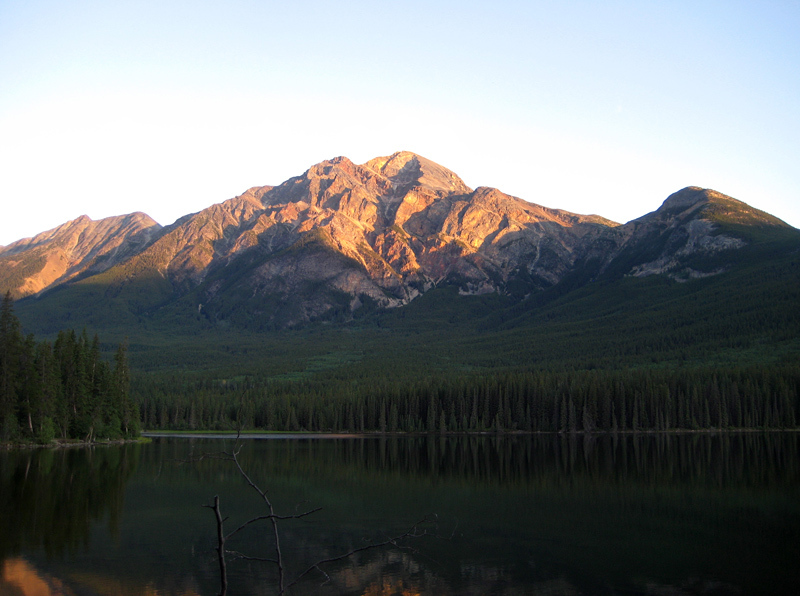 After six long hours of climbing and 5,035ft of elevation gain, the entire mountain lies beneath your feet. 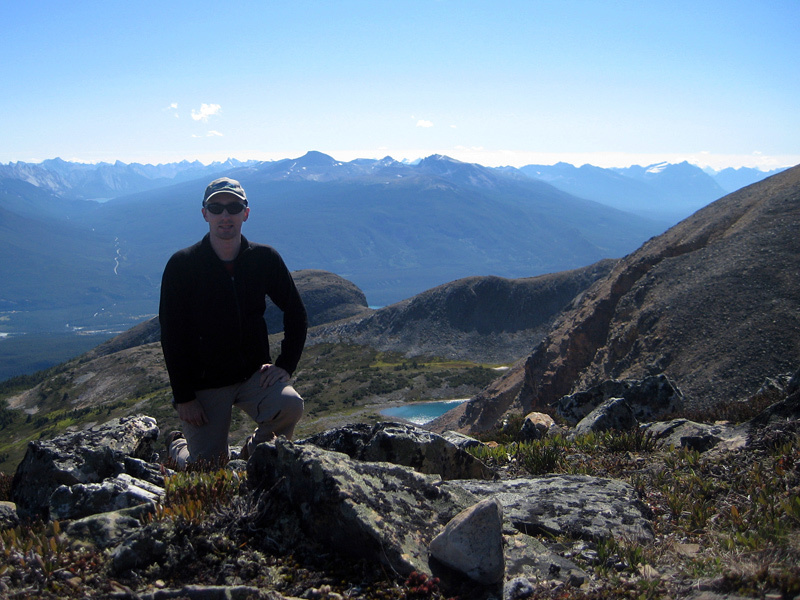 All the landmarks of the region — Roche Miette, Maligne Lake, the Ramparts, Mt. 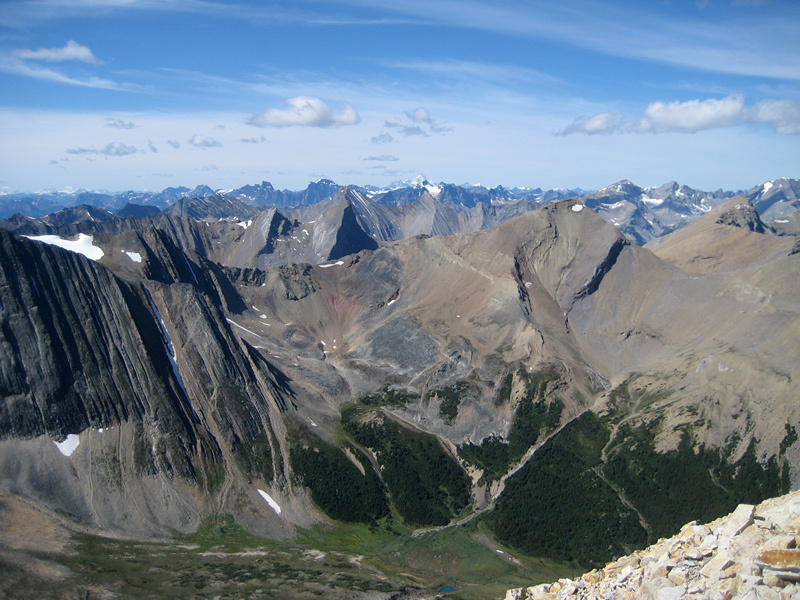 Edith Cavell, Mt. Robson, and hundreds of others in every direction — come into spectacular view. With all your pictures taken, victory brownies consumed, and your body somewhat rested, you take one last look at those incredible surroundings and begin the descent. On the way down everything seems much steeper than you remember, but progress comes quickly. Soon you find yourself on the shoulder, then on the meadow far below, and then rapidly (or in my case, way too rapidly) descending the fire road on your bike. Within three hours the trailhead and its promise of a return to civilization is reached. Battered, bruised and dehydrated, you've ridden, hiked and climbed over 30km of punishing terrain during a gruelling 10-hour adventure... but you've seen sights few could ever conceive, and even better, you earned it. While a bike isn't necessary for this climb, you will bless it mightily at the end of the day when all you want to do is descend. This even, if like me, you're a poor cyclist and end up pushing the bike most of the way up the mountain. If you don't have a bike, there are multiple places around town where they can be rented. Important: Make sure that whatever bike you bring has excellent brakes, as the descent from the meadow area to the fork is steep, narrow, and very fast. You should also be wearing a helmet. My ride down the hill on a bottom-end Canadian Tire special led to a very unintended, yet solid test of my Alpina helmet. 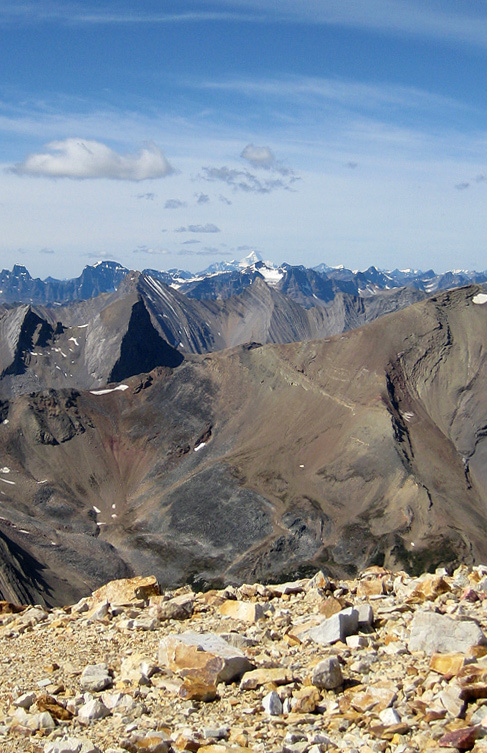 Kane's Scrambles in the Canadian Rockies describes a similar ascent route for Pyramid Mountain and includes details of an alternative descent route to the southeast from the peak which passes a large tarn visible from the shoulder area during the climb. 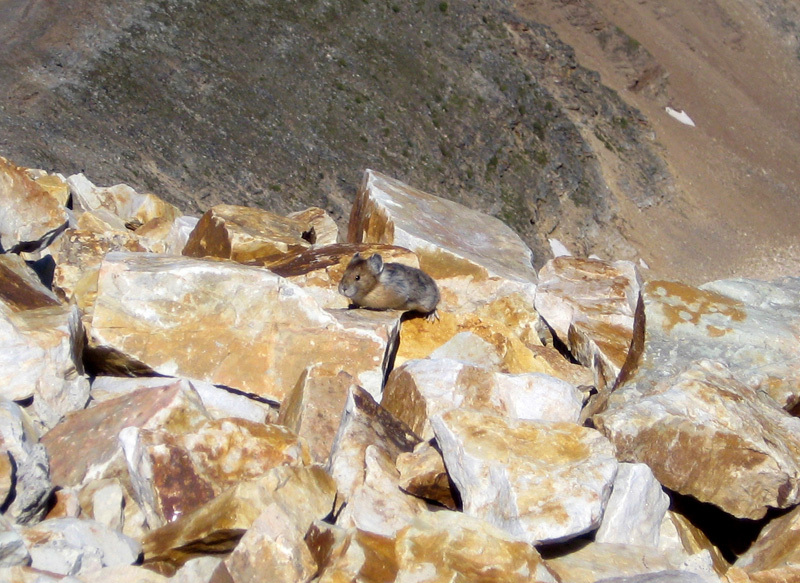 Summit: 2,257 m / 7,405ft.